* Fringe: 100 % Cotton Crochet, Ribbon Tassel. 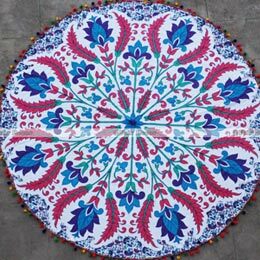 * USAGE: Beach Sheet, Beach Throw, Picnic Throw, Table Cloth, Wall hanging , Tapestry…etc. This POM POM Roundie is printed on the front side only.